Air hockey is one of the most enjoyable indoor sport that is becoming so popular nowadays, Over the years Air Hockey has emerged as one of the greatest sport for players and fans. If you don't know much about this sport, it's very easy to learn and acquire skills like a pro. Air hockey requires two players who play against each other on a low friction table using a puck. A hockey table mainly consist a smooth playing surface and a few inches tall rail that prevent the paddles and punk from leaving or falling off the table. How to Play Air Hockey. The Air Hockey burst onto the scene in 1972 when it was first released to the public by the Brunswick Billiards Company. Within a few years, air hockey tables could be found in bars and in gaming rooms throughout the United States. And public tournaments began to take place in cities across the United States. Throw a coin to determine who will get the first disc or be a good player and let your opponent have the first disc. You can even place the disc in the center of the table to have a face-to-face exit to start the game. Strike the disc from your side of the table next to the opponent within seven seconds or you will receive a foul that will force you to give the disc to your opponent. 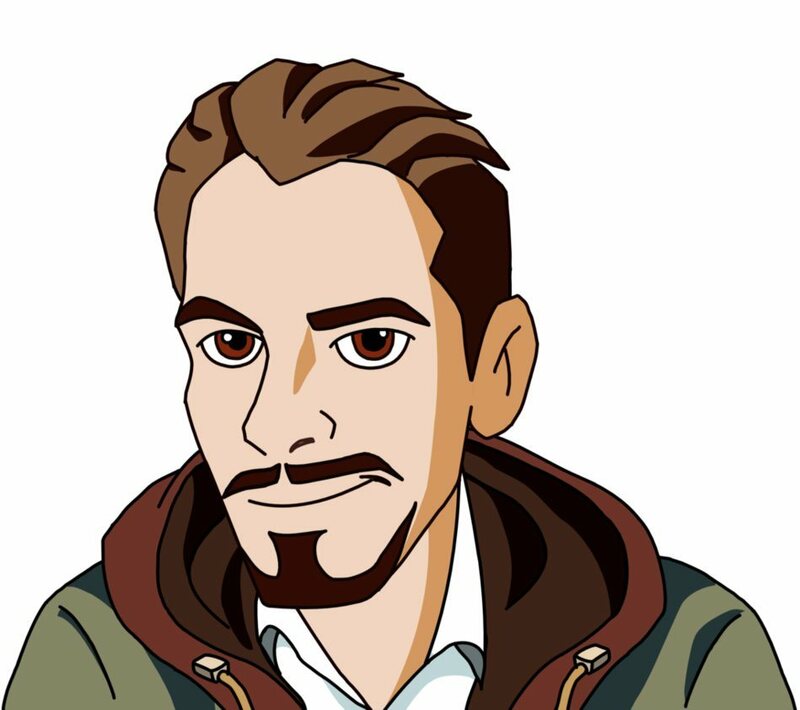 Your opponent has seven seconds to return the disc or it will return to you manually. Protect your goal constantly and hit the disc towards your opponent's goal at every available opportunity. Give the disc to your opponent if you hit the disc and get outside the limits of the tables. The game winner will be the first player to score seven points. Air Hockey was first played in Venezuela in the mid-199os. A lot of people joined this sport ant it drew a lot of worldwide attention that led it to grow so fast. The group of Venezuelan players quickly grew to around 70 players and their weekly air hockey tournaments raised to 5 tournaments per week. After the 1st participation of air hockey in the World-Championship, the Venezuelan-air-hockey-took a great leap in-this sport, where Jose Mora & Pedro K. Otero dominated the podium of the World Championship between the years 1998 and 2002. Jose Wot Mora was a world-champion in 3 consecutive championship editions (1998, 1999 and 2002), becoming the only first non-American player to win this title. However, during the same year 2002, he marked a turning-point in one of the evolution of Venezuelan air hockey. Several factors, including the social situation of the country, led many of the key players to withdraw and many others emigrated abroad (such as Jose Mora, who emigrated to Houston, United States, Pedro Otero and Emilio Araujo who emigrated to Spain Since then, no new competitions have been held in Venezuela, and the same successes have not been achieved at the international level. In 2003 the first-official competitions began to take place in Barcelona (Spain), marking the birth-of-European a﻿﻿﻿ir﻿ ho﻿﻿cke﻿﻿y. In fact, since 1997 they have played, annually, championships in Catalonia, but without even following the official rules of the USAA. In 2002 & 2003 the association "Air Hockey Catalunya" was founded, which obtained averages of-participation of 20 players per tournament. In March 2006, a new milestone was set for European air hockey, with the participation of the first European player, the Spaniard Mauro Starless, at the Las Vegas World Championships, where he finished 31st out of 60. In November of the same year took place in Sabadell the first European Championship of this sport, in which players from Spain (Catalonia and Andalusia), the Czech Republic and the United States participated. The victory in the individual tournament was for the Serbian American Goran Mitic, while the European Champion was the Spanish Jose Luis Camacho. In the team mode, Catalonia (Spain) was proclaimed champion of Europe by defeating in the final to the Czech Republic. In 2007, three new associations have been formed in Seville, Moscow and the Czech Republic, which will organize air hockey competitions in their respective cities. 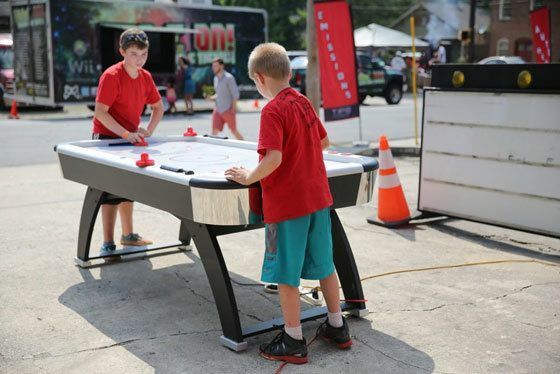 Currently, the only tables approved by the USAA (United-States Air-Hockey Association) are the 2,44-meter Dynamo tables, among which we find "Photon", "Pro-Style", "Blue -Top Brown Top Purple Top "and" Black Top "without drawn game lines. It has to be uniform and symmetrical across its circumference. You cannot alter or wear a mallet to modify the angle of contact with the table. We can find, mainly, two types of decks: the high tops and the flat tops low top). Generally, decks are manufactured in the United States, but there is an official flat deck model that is manufactured in Tarrasa. "USAA" and "AHC" approved discs are "Lexan" models, and may be red, yellow, or green. f you want to become a champion on this sport, just play using several strategies and follow what your coach instructs you to do. 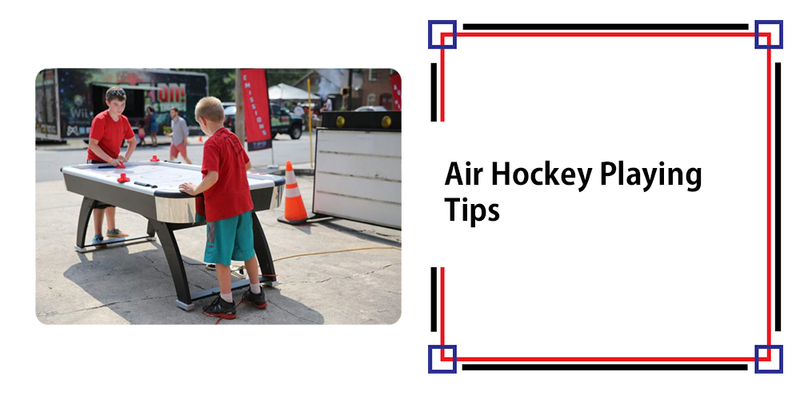 Air Hockey is fun and it was designed for people to enjoy themselves and family.For more air hockey palying tips here.